Candidates are assessed by Evaluators against the WCA Skill Standards, which are broken down into categories (milling, sawing, sanding, etc.) containing tools (tablesaw, jointer, wide belt sander, etc. ), which are further broken down into Tool Operations (ripping, cross cutting, flattening, etc.). Candidates purchase assessment credits from the WCA and use them as they are assessed and earn Skill Points; one point for each level tested on an operation. Testing at Level 1 consumes one credit and earns one skill point, and level 2 an additional one credit and one skill point. If a candidate is tested at level 2, they are automatically tested on Level 1 criteria as well and use two assessment credit. Note: 10 free assessment credits come with the purchase of every passport; additional credits can be purchased at $5 each. For example, to earn a Green Credential, which requires 30 Skill Points, a candidate would need to purchase an additional 20 credits for $100 to complete the testing. Learn more about the requirements for other certificates and credentials here. 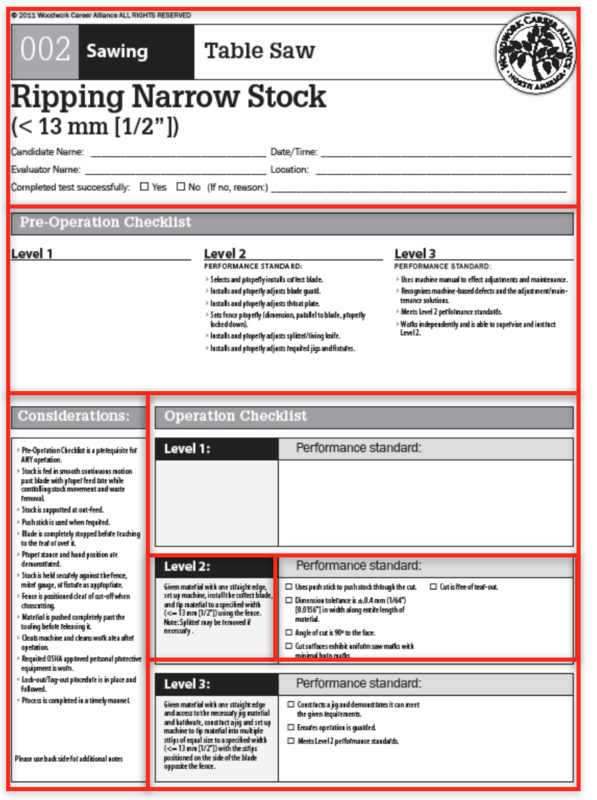 Pre-Operation Checklist – Assesses candidates knowledge of the tool’s controls. Considerations – Assesses safety and the candidates technique when performing the operation. 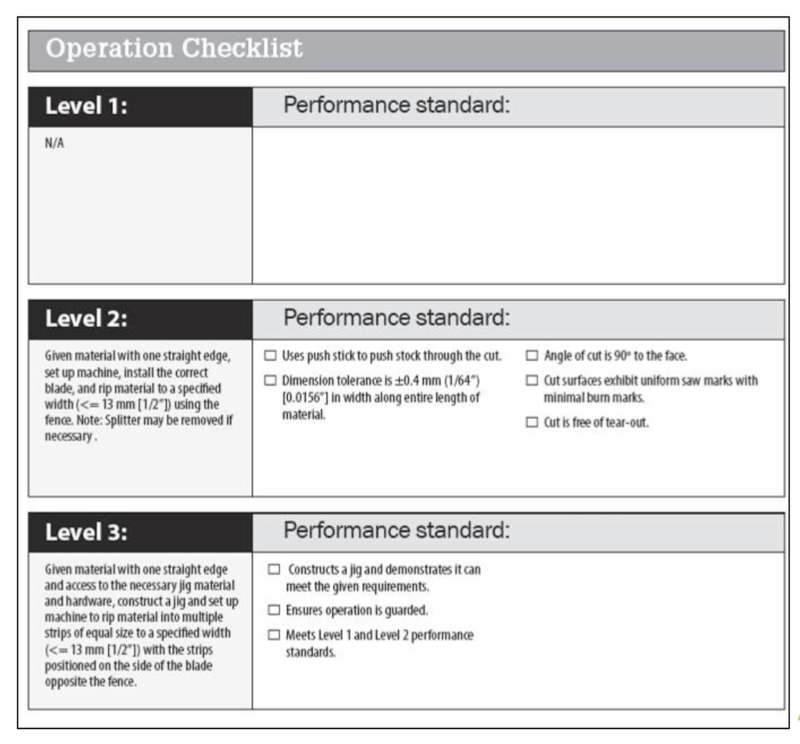 Operation Checklist – The measurable result of an operation. All candidates must pass the Skill Standards BASIC Measuring and Layout evaluations before being assessed on any other operation. This section guides the evaluator in assessing the candidate’s knowledge of the machine and its controls and applies to all the operations for a particular tool. 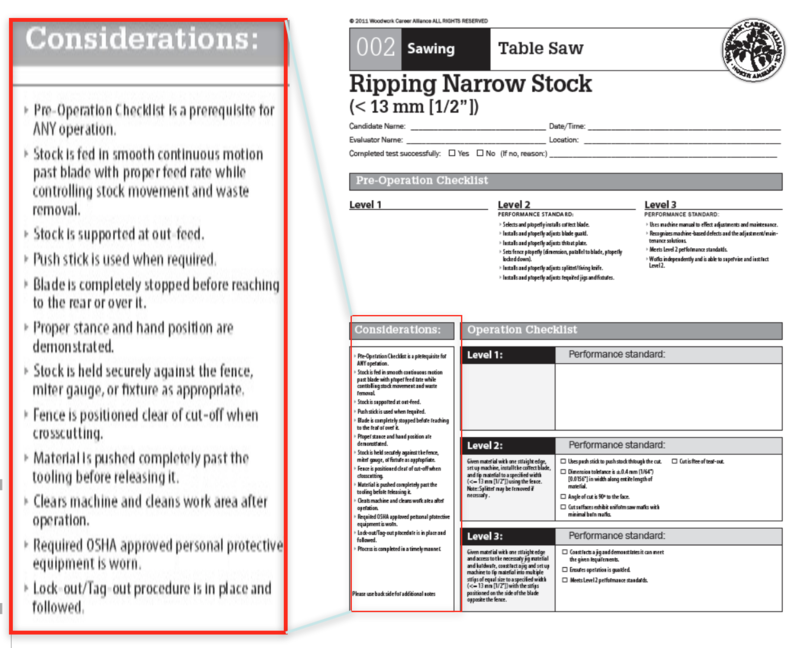 This section is a general guideline for the evaluator; a candidate might fail one or two items in this area, but not fail the assessment if it is the judgement of the evaluator that it was only a minor error in judgement that didn’t affect safety, such as forgetting to open the dust collector blast gate. However, if the candidate shows a general lack of knowledge of the tool, the evaluator may elect to fail them. This section guides the evaluator in assessing the technique and safety awareness. This section is a general guideline for the evaluator; a candidate might fail an item in this area, but not fail the assessment if it is the judgement of the evaluator that it was only a minor error in judgement that didn’t affect safety. However, if the candidate shows a general lack of knowledge of safety or technique awareness, the evaluator may elect to fail them. This section is the heart of the assessment and contains the observable, measurable output of the operation. For example, if the candidate is being assessed on Tablesaw->Ripping, the evaluator will judge the board that was ripped during the operation. The candidate must pass ALL line items in this section in order to pass the assessment. Note that if a candidate is being assessed at Level 2, they are also being assessed on the Level 1 criteria as well as any additional Level 2 criteria. Each Level consists of a scenario for the operation. In the case of Level 1, the Evaluator sets the machine up for the Candidate. In Level 2, the scenario requires that the Candidate setup the machine prior to performing the operation.